This is a single Trial Deck. 50 cards per deck 6 decks per box. WeiB Schwarz cards use standard size deck protector sleeves. English text. To order a full box of trial decks, you must order a quantity of 6 individual trial decks. 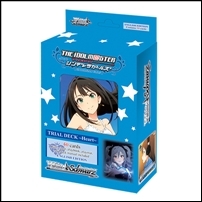 If you order a full box, you will get a sealed box of trial decks when available.